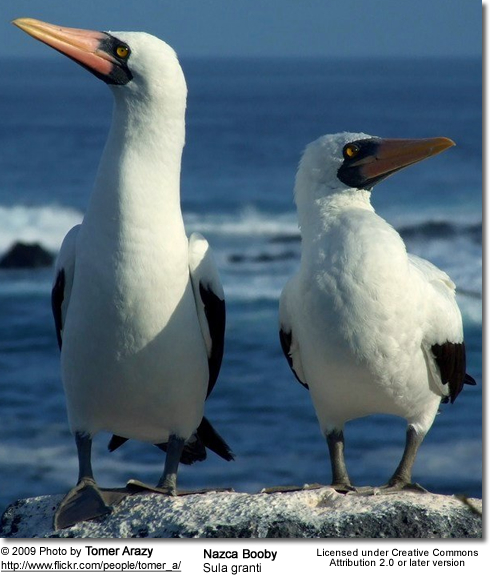 The Nazca Booby, Sula granti, is a booby which is found in the eastern Pacific Ocean, namely on the Galápagos Islands where it can be seen by eco-tourists, and on Clipperton Island. The Revillagigedo Islands off Baja California which possibly constitute its northeasternmost limit of its breeding range. 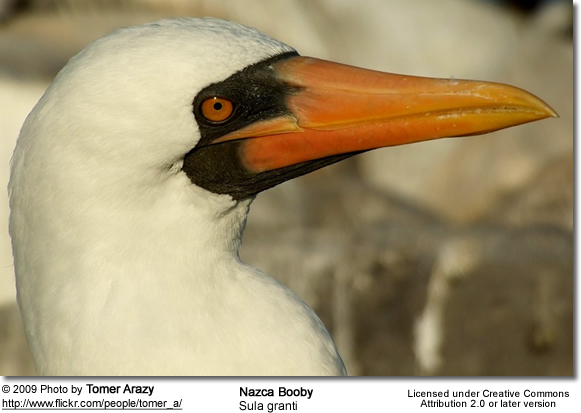 It was formerly regarded as a subspecies of the Masked Booby but the Nazca Booby is now recognized as a separate species. They differ in regard to ecological and morphologica as well as mtDNA cytochrome b sequence data. 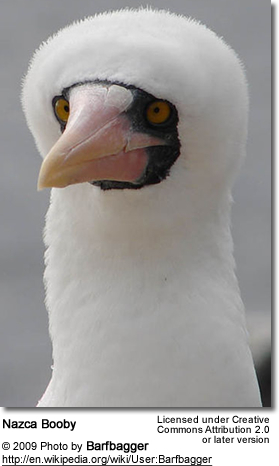 The Nazca Booby co-occurs with the Masked Booby on Clipperton Island, where they may rarely hybridize. 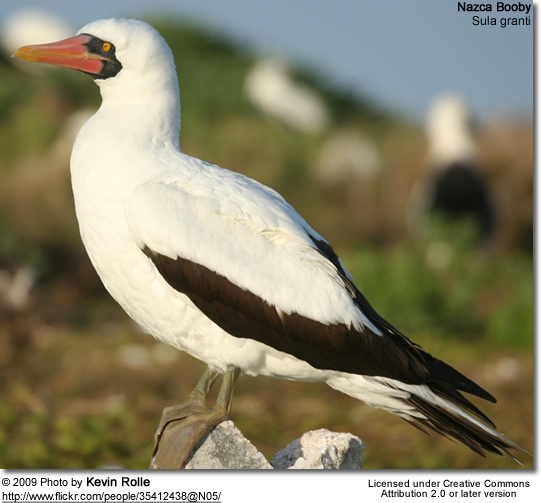 Nazca boobies are known for practicing obligate siblicide (Anderson, 1990). They lay two eggs, several days apart. If both eggs hatch, the elder chick will push its sibling out of the nest area, leaving it to die of thirst or cold. 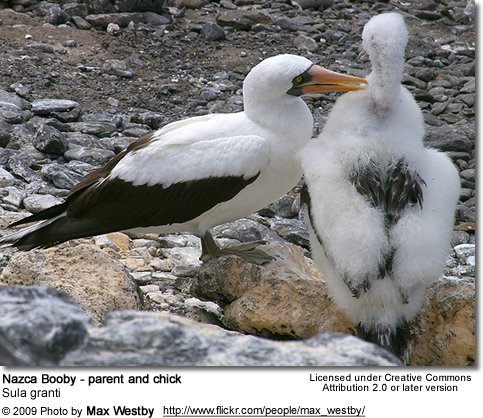 The parent booby will not intervene and the younger chick will inevitably die. 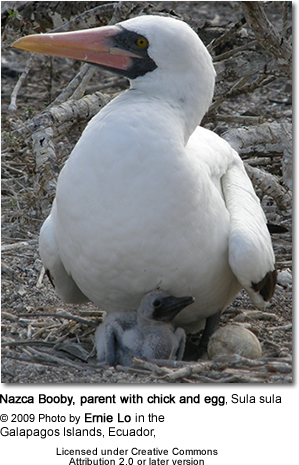 It is believed that two eggs are laid so that one remains an insurance in case the other gets destroyed or eaten, or the chick dies soon after hatching. In a study published in PLoS ONE (June 18, 2008), biologists linked the murderous behavior to high levels of testosterone and androgens found in the hatchlings. According to the study, the high hormone levels also cause the surviving chicks to behave like bullies after they grow up. Adults that have failed to breed frequently seek out nestlings in their colony, and during those visits they often bite, preen and even try to copulate with chicks. This behaviour is known as NPAV, which stands for Non Parental Adult Visitor; the causes of this behavior are not fully understood (Anderson, 2004). Perinatal Androgens and Adult Behavior Vary with Nestling Social System in Siblicidal Boobies. PLoS ONE 3 (6): e2460. June 2008. doi:10.1371/journal.pone.0002460. Retrieved on 2 July 2008. High Hormone Levels in Seabird Chicks Prepare Them to Kill Their Siblings Newswise, Retrieved on July 1, 2008.